JFormDesigner is an application that enables you to create Swing GUIs in an efficient manner as it provides support for Java code generator or runtime library, form localization and generating nested classes. The program can work as a standalone application or as a plugin for several integrated development environments. The application stores the configuration settings of your Java Swing GUI within your projects. For each new project you will need to enter its name, description and location. Optionally, you can enter the location of Java source folders, the folder containing your custom JavaBeans and edit global and project-specific parameters. Some of the app’s strongest features allow you to set up the GridBagLayout, Delete localized messages, edit the format used for generating keys, rename resource keys and much more. 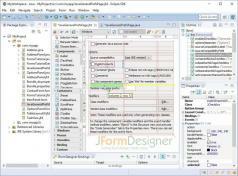 You can generate Java source code to edit the Java Code Generator and it is also possible to select a superclass to create forms.